About 40% of Baby Boomers plan to move at some point in the future, according to the Demand Institute, a non-profit organization run by The Conference Board and Nielsen. Some have become empty nesters with extra bedrooms and baths they no longer need. They’re ready to get on with the next phase of their lives, which includes moving to a smaller, more manageable home. Others will move to smaller homes in 55+ communities where they can remain independent while being guaranteed a place to live if their health declines. And it isn’t just Boomers. Many younger people are also realizing that there are benefits to living a bit smaller and more simply. Heck, a few years ago I had a 3,000-square foot primary residence plus a three-bedroom beach house. The home I recently bought in Santa Barbara isn’t even 1,100 square feet … and while we plan to put on an addition, life is great for our family of three even in the current footprint! Do you and your spouse agree? In concept, you probably do. But there are often emotional attachments to your current home — memories, belongings, and a sense of security that one of you might not be willing to part with. There may also be other differences of opinion that need to be explored as well – everything from neighborhood choices to layouts to aesthetics. The more you discuss things ahead of time, the better! The average U.S. household has 300,000 things stored in 2,422 square feet. That’s a lot of stuff! The federal government also estimates that a quarter of Americans with two-car garages don’t use them for automobiles. For many of us, just cleaning out the junk drawer in the kitchen or the refrigerator is overwhelming. And as someone who’s moved a dozen times in the last 15 years, I know all too well how much work the process can be! Does your home define who you are? Have you spent years planting a garden or nurturing a large yard that’s the envy of your friends and neighbors? Do you have a workshop, garage, craft room, or other space where you tinker or make things? Is there a pool where you can swim in privacy? At the end of the day, does your home let you sit back with a sense of comfort? If so, you have to think about how a different place might change all of that. It’s easy to get a handle on the price of a smaller home. But you also have to include the cost to sell your current home, such as real estate agent fees and closing costs. Will you walk away with enough cash to buy the new one? Or will you have to take out a mortgage? Moving far away? You’ll want to visit friends and family regularly. So allocate money for travel expenses. Will your downsized lifestyle include more time for cruises or other trips? Don’t forget to put those costs in your budget. Are you going from the suburbs to the city? Property and local city taxes will likely be higher. The same if you move to a warmer climate, to a home in a gated community with a golf course, club house, tennis courts, landscaping, or exterior maintenance. The property may be smaller than where you now live. But HOA fees for all those amenities could be steep. Moving your stuff will cost money, too. Or maybe you plan on storing your possessions while you downsize. Storage costs can pile up quickly. Getting rid of everything? Fine. Then be sure to add the expense of new furniture. Some areas of the country have had huge spikes in real estate prices. It’s not unusual to see homes in San Francisco, Boston, New York, and West Bellevue, WA that sold for $250,000 at the turn of century selling for $1 million today. The first $250,000 is exempt from capital gains tax if you’re single or $500,000 if married. Above that, you better allow for taxes of up to 20%. Could the size of your household change? You might be an empty nester now with space to spare. But is it possible that an adult child or elderly family member could move in with you? Downsizing your home may make that impossible or at the least very crowded. Have you considered Swedish “death cleaning”? Some of the stuff in your current house represents years of important memories. The rest is mostly junk. So can you let go of the other stuff and prioritize only what’s truly important so you can get on with the next phase of your life? It’s not about mopping or dusting. It’s about embracing minimalism. The thinking here is that the more you pare down, the better you can focus on what’s really important in your life. 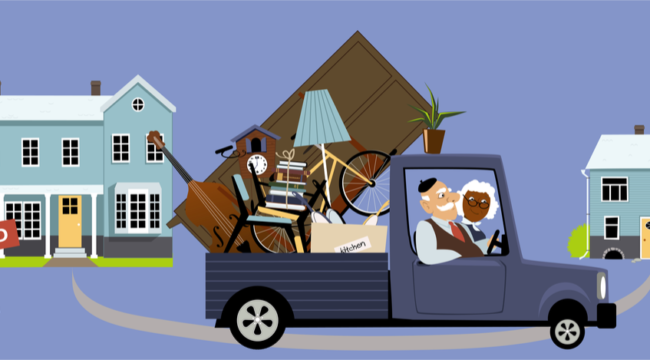 So even if you DON’T have any intention of downsizing your actual residence anytime soon, I definitely recommend a round or two of de-cluttering anyway. Our family has done quite a purge over the last couple years and it’s been terrific. Having fewer things to worry about could make your life more manageable. What’s more, getting rid of stuff reminds us that things don’t last forever. And it also leaves less garbage for other people to deal with when we’re no longer around. Just remember: If you decide to donate some things to charity, get an itemized receipt for tax time! At the end of the day, downsizing your home – or even just your possessions — can be hard and stressful. But it can also provide big rewards. So look before you take the big leap, understand all the available options, and make a list of what’s important for the next phase of your life.